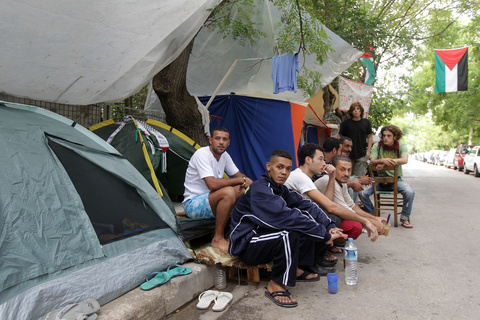 On Monday morning, (27 December 2010) riot police attacked dozens of Palestinian refugees who had been camping outside the UNHCR offices in Athens for the last three months in the expensive suburb of Psychikon, demanding asylum. 8 of them had been on a protest hunger strike for the last three weeks. The riot police beat up the refugees and brought in bulldozers to destroy their tents and force them to leave the site. On Sunday 19.12 32-year old Emad Aziz, from Egypt, slipped off the third floor of a building of the Ministry of Employment and Social Security in central Athens. Emad, who was cleaning the exterior windows at the time, worked with no social insurance. He was immediately transferred to hospital where he passed away. Vlasia Papathanasi, the general secretary of the Union of Cleaners and Domestic Workers, stressed that the cleaning of the building had been commissioned to a labour recruitment office which used a loophole in the law in order to employ Emad without offering him social insurance. Emad was the father of four children. The Cleaners Union is calling for a gathering on Wednesday 29.12 at 6 pm outside the building where he died at number 4, Korai Street in Athens. About 13:30 local time, some officials of greek ministry of cops warned Palestinian refugees who have camped for 2 months outside the UN offices ( in Psihiko-Athens) that tonight will be a bloodshed, if they do not take their tents and leave the space outside the UN offices. The Palestinian refugees (mostly laborers, many with their children) who are so long mocked by the authorities and by their fellow country men inside Palestinian community and the Palestinian Embassy, said that they will not leave, and that they will confront the attack of the police. Right now and for the first time in these two months of their struggle, riot police forces are making their presence in the region . For many months, cops presence was limited in the area and didn’t look for troubles. Now things are changing. Be in alert. To destroy the plans of the minister and stand in solidarity with Palestinian refugees. Another immigrant that has frozen to death was discovered yesterday in the Nea Vissa region. He was between 25 and 30 years old, from Africa. Last Friday, December 17, two more dead immigrants were discovered in the same area, while a third one was found almost dead and transfered to the Didymoteicho hospital. 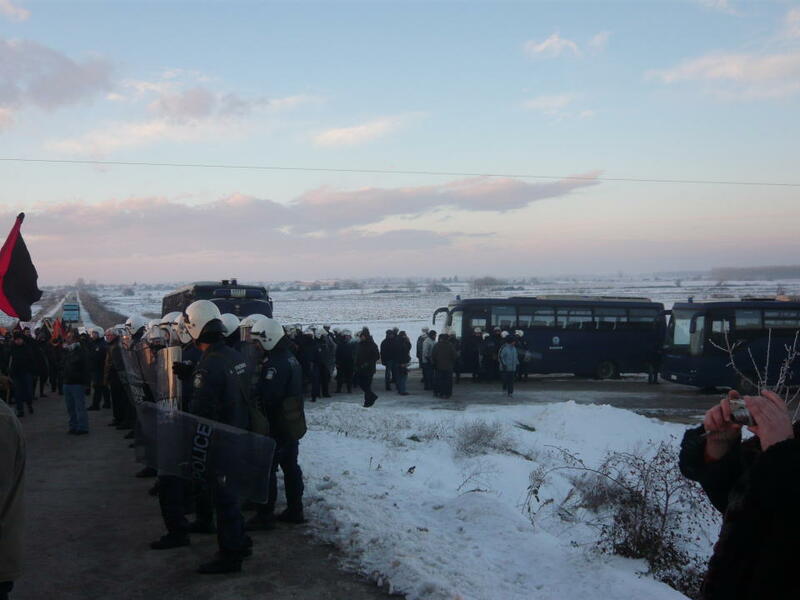 On December 18 a mobilisation was organized at the Evros region. Early on the afternoon there was a protest outside the Fylakio detention centre and later a demonstration in Orestiada, where the Frontex headquarters are located. You can read more in our friends from w2e report: http://w2eu.net/2010/12/19/fylakio/. On December 19, in the city of Patras, members of new-nazi organization tried to hold a protest against the presence of immigrants near the train station, hoping to imitate the so-called ”citizens’ committees” that new-nazis have set up in Athens. Unfortunately for them, they were attacked and chasen away by a group of 60 anarchists. On December 20, in Athens, some 100 Afghans and Iranians who are camped outside Propylaia (University of Athens) and UNHCR respectively, held a demonstration and a gathering outside the ministry of public order, demanding to be granted asylum. Geneva – Governments need to open their eyes to the benefits of migration and share that vision with the public at large, says the International Organization for Migration (IOM) as it marks International Migrants Day. All too often now, the positive contributions migrants make to society are being called into question as many governments adopt short-sighted attitudes, presenting them as a burden to convalescing economies or a drain on the welfare state. Yet, evidence of migrants’ contributions abound. A study published earlier this year by University College London showed that newcomers from Eastern Europe paid 37 per cent more in taxes than they received in benefits and from public services in 2008-09. Many more migrants helped to provide critical public services as doctors, nurses or cleaners in the National Health Service. Another recent piece of research highlighted the positive entrepreneurial impact immigrant communities have on the British economy. In the United States, native-born Americans gain an estimated USD 37 billion a year from immigrants’ participation in the US economy, according to the President’s Council of Economic Advisers. More than one in 10 self-employed business people in the US is an immigrant. According to IOM’s recently launched World Migration Report, international migrants could number 405 million by 2050 if migration continues to grow at the same pace as during the last 20 years. One of the reasons for this steep rise will be the population decline in the world’s industrialized countries, an expected drop of nearly 25 per cent by 2050. This will significantly increase the demand for migrant workers at a time when the labour force in developing countries will increase from 2.4 billion in 2005 to 3.6 billion in 2040. In many countries, migrant workers at all skills levels will be needed for knowledge and innovation as well as for jobs that nationals cannot or do not want to fill. These include health care, looking after children and the elderly, public services, the service industry as well as agriculture and construction. The World Bank estimates that if countries with declining populations allowed their workforce to grow by only 3 per cent by letting in an extra 14 million migrant workers between 2001-2025, the world would be USD 356 billion a year better off – with the majority of these funds flowing to developing countries. Migration is here to stay and governments have to choose between adopting a “high road” or a “low road” scenario to manage migration. The “low road scenario” is one of status quo based on stereotypes, fear, and short-term political expediency. It is characterized by restrictive migration policies and the paucity of dialogue on migration, at national, regional and international levels. At the opposite end of the policy spectrum, a “high road” scenario would heighten recognition of migration as an integral part of the global economy and of migrants as vital constituents to any full recovery from the current economic crisis. It would implement policies that better meet increasing demands for labour migration, protect the rights of migrants, promote regular dialogue between countries of origin and destination and highlight the economic and social contribution of migrants both in home and host countries. “The challenge is to find humane and equitable solutions that reconcile people’s desire to migrate with the national sovereignty of States on population movements. Cooperation is not only essential to ensure the rights of migrants are respected but also to migrants respecting the culture and laws of host countries,” Swing concludes. In its 2009-2010 report “European borders : controls, detention and deportations”, Migreurop has dedicated one chapter to the Adriatic border, especially to the, sometimes illegal, “readmission processes” of migrants between Greece and Italy. On this internal border of the European Union, as well as in the ports which constitute its most crucial junctions, cases of violence, of arbitrary deportation, of rights’ violations, of abuse and “accidents” are on the increase, tragically rising the number of victims as time passes by. Kinisi, an organisation based in Patras, announced, in a communiqué dated 2 December 2010, the death of Sardar Ayari, a 25 year old-Afghan and a father of 3. This happened on the edge of Patras, on the national road E55 which connects the city to Athens. Every day, at the outskirts of Patras, migrants try to get in trucks off to Italy. According to many witness reports, one truck stopped at a red traffic light on 27 November 2010 at 4.00 pm. A group of migrants took this opportunity to hide in the trailer. Apparently, despite many people standing on the road, a second truck, registered in Italy, instead of slowing down, has voluntarily charged at the migrants. Sardar Ayari has been crushed between the two vehicles. He died a few hours later at the hospital ; according to the doctors “it’s as if a bomb exploded in his stomach”. After listening to the various reports by witnesses of the accident, the police let the truck driver, though responsible of what happened, go. Kinisi, a Greek organisation which defends the rights of migrants and asylum seekers, denounces the way the investigation has been conducted on the circumstances of the accident, as well as the way the local press covered the event as a “unfortunate/sad road accident which happened to a young Afghan”. On December 2nd, 2010, a press release from Osservatorio Faro sul porto e dell’ambasciata dei Diritti d’Ancône reported the death by suffociation of a 16 year-old Afghan, on the ferry Cruise Europe – a vessel which belongs to the shipping company Minoan Lines – on the Patras-Ancône line. The young man was hidden with one of his national fellows aged 15 in a truck driven by a Bulgarian who has been arrested for facilitating irregular migration. On their way, on grounds which remain to be determined through an autopsy, the ship crew was alerted by the victim’s mate of the latter feeling bad. The death is under investigation by the border police, but the death of the young Afghan was considered as “natural”. In both cases in Patras and Ancône, it is a scandal that the authorities conclude that the deaths result from a trivial incident and natural causes. Indeed, no matter how people travel, there’s nothing natural in someone dying being crushed between two trucks or by suffocation in a trailer on a ferry boat, simply because these people wanted to cross the border. On 23 November, 4 Iranian migrants in exile were found dead as well, from asphyxiation, in a truck were they hid, hoping to reach Italy. In order for these victims not to be forgotten, and to keep on shedding light on what happens along this internal EU border, the Tuttidirittiumanipertutti network will rally, on 11 December, 2010, on the day of rights. At 10.30 am, the migrant community’s march against the « sanatoria truffa » will arrive at the police regional station and will then head off to Venice’s port. At 1.00 pm, a ceremony to honour Zaher’s memory will be celebrated in the port, to mark the opposition against all deportations and defend the right to asylum. Both Brescia and Venice demonstrations are part of the route leading to Rome on 14 December 2010, “UNITED AGAINST THE CRISIS”, to underline the mistrust against the Italian government.